1. Be Your Own Designer: Go through magazines, catalogs and visit baby & furniture stores to see the looks available. Choose a style that feels most natural to you so the nursery can become an extension of your home. Then create your own book or board of clippings, fabric samples and photos for inspiration. Start the design process well before your due date so that you have time to relax before the baby’s arrival. 2. Save the Paint for Last: Select your nursery furniture and fabric before you paint. It is easy to find a paint shade to match your furniture/fabrics and not always the other way around. Keep in mind, furniture and fabrics do not all need to match – a great mix of textures that complement each other can add a truly custom, “designer” feel. 10. The Essentials: When designing your nursery (large or small), you should always keep these essentials in mind – a crib, rocker, changing table/dresser, light dimmer switch and books within the little one’s reach. If you do not have enough space for a bookcase, a basket for the floor will do the trick perfectly. Your little one will be crawling around before you know it and handing you their favorite book at bedtime! 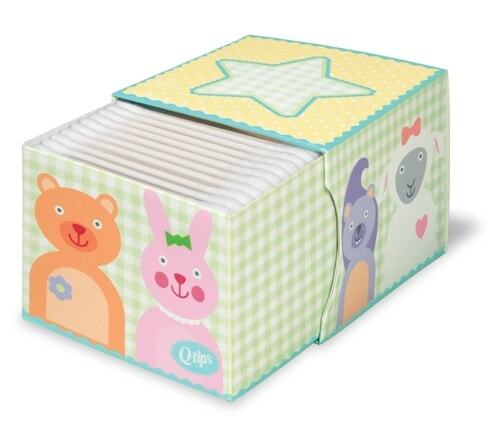 And for the perfect accessory why not try Q-tips’ new Baby Packs? The colors will go with any decor! You no longer have to hide everything in a basket because the box is as cute as anything else in the room. Comes in 2 styles and holds 285 Q-tips. Previous Post: « American Museum Of Natural History Goes Digitial!